It’s such a pleasure to have Elizabeth Rose as part of our team and a visiting practitioner at Gazelli House, our sanctuary of wellbeing and spa in South Kensington, London. Elizabeth works to increase all aspects of wellbeing, including love, fertility, life goals and purposes through energy cleanings, aura cleansing, ancestral/familial healing and Angel Reiki. Here she shares with us her experience of the healing properties of particular crystals and the ways they can help us to enhance our lives. 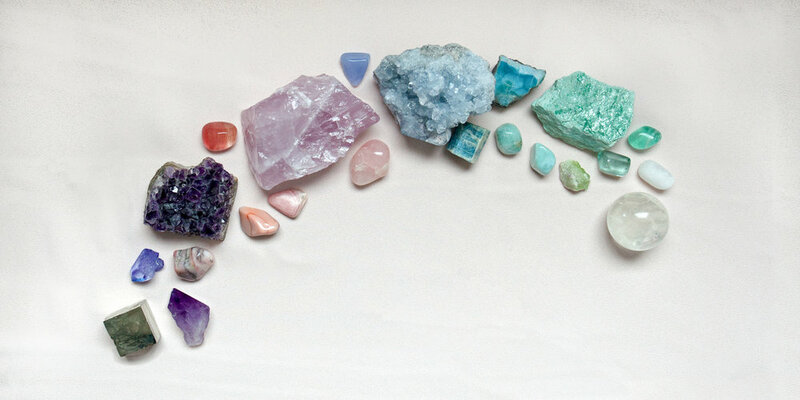 Crystal healing therapy uses crystals and minerals to aid healing in the belief that positive energy from the crystals flows into the body, allowing negative energy to be dispersed. The benefits of crystal therapy are thought to include aiding relaxation, the relief of stress and pain, and balancing energy within the body. The crystals are placed on the sites of pain, on energy vortexes called chakras, acupuncture points or meridians. Each crystal is also associated with a particular archangel or spirit guide and a colour within the light spectrum. Here Elizabeth guides us through the meanings and properties of some of the most beneficial crystals – one to represent each of the eight chakras. Beautiful yet steely, this stone works to ground our energy and strengthen and seal the aura. This has a protection and stabilising effect. It also helps us to work systematically through our responsibilities and choices. Works to fire up our adaptability and creativity. If you are stuck and blocked - pick up this stone and the ideas will start to flow again. It is a great stone to wear on a date or social occasion. Helps us to focus and move unflinching towards achieving our goals. This stone intensifies the connection between our will and our actions. It also increases confidence and can be a great ally or support in your pocket. With its electrifying green hue, this crystal opens and soothes the heart like few can. It promotes self-love and helps you heal your heart. It can also call True Love to you. Archangel Michael & Archangel Haniel. This crystal is full of Divine Grace and Angelic presence. It takes you to your higher self another realms. It can uplift you out of the base nature of Life and return you to your more noble nature. It facilitates connections of all kinds. To find out more and to book a session with Elizabeth Rose, email the team at Gazelli House here. Discover the crystal for you with a complimentary one to one appointment with Elizabeth Rose on the 18th April. You’ll also have the chance to meet crystal experts Mystic Gates and discover zodiac beachwear from Fase de Moda. You can find out more here.